However, the subject is so broad, there could be 100,000 "what is this icon?" or "what does this icon mean?" 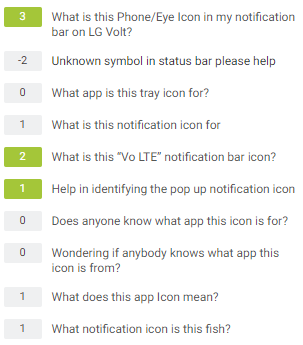 questions for all the Android apps that send notifications and all the system icons. Could there be a canonical question with a few examples (of some harder-to-guess app icons and system icons, like the Cast icon) to help cut down on these questions? It would also tell viewers to find the notification belonging to that icon and tap-and-hold it to find the app name (or look above the notification on some Android versions, like 7.x). Can you tell me what is this icon in the following image that I received from my son/daughter/wife/friend.. ? Followed by some low resolution image (which gives us virtually nothing relevant in Google reverse image search) and sometimes they don't even bother to upload one. I think specially this category of questions need to be closed as too broad or as "Questions asking us to find an app...are off-topic". They really are, as we cannot be expected to guess out of millions of apps for a question which doesn't seem to be worth answering for. Why not worth it? Such questions can easily be solved if only the asker directs their curiosity to the person who sent them the screenshot instead of directing it here. We should not serve as an alternative to the interpersonal communication problems of people. Furthermore, such questions are not solving a real-world problem of us. Curiosity is fine, and we do have many questions born only out of curiosity but they are mostly along the technical lines, and that often creates a boundary within which an answerer can always work and feel rewarded (generating a content that explains something or leads to a solution is a reward in itself) even though they may never get an upvote for their efforts. In addition, serving an answer consisting of only an app's name rewards such askers' to ask such poor questions again, then again, until we are overwhelmed with so much noise that we can't answer them anymore. Yes, nobody is obliged to answer any of them and can ignore them through tags, but leaving the mess to continue seems irresponsible to me. I, thus, appeal to others to consider closing at least this category of questions. As for the ones where the asker has the icon related problem in their own phone, I agree that a canonical Q&A should be made, or the questions be closed as a duplicate to the ones mentioned by Andrew T. in his comment. If the existing answers doesn't work for the potential askers, then they should offer a bounty instead of popping up a new question. I think you're right that there could be a canonical "how do I identify which app sent a notification?" question, and I'd encourage you to write one if you can't find an existing one (I don't know of one). What notification icon is this fish? That seems very good: "fish" is an obvious search term, and if you're starting from a picture of a fish and you see this question title, you might guess it's about your icon. This is a bad title. It doesn't have enough information to distinguish it from another icon identification question. When you find questions like this, please go ahead and edit them to be more descriptive. Not the answer you're looking for? Browse other questions tagged discussion questions clean-up .